The latest in fashion is not a new dress or pair of pumps but is this white rose with pink tips called the New Vogue. These White Roses with Pink Tips will add a splash of color at your next event and will create a sensation that most other roses envy. New Vogue roses can create the ambience of love and purity due to its due colored blend. These flowers are great for a bouquet or for the home when one is trying to create a romantic loving feeling. All of our White Roses with Pink Tips are grown in our state of the art greenhouses located in some of Colombia's most sun filled places. We have hand selected these locations in order to help our roses grow to the best nature intended. We grow our roses all year round so that whenever you are in need of White Roses with Pink Tips we will be right here at Globalrose.com ready to take your order. We also believe in protecting the environment that is why we have chosen to go green and to all we can to protect our atmosphere. Our roses are fresh cut and need a minimum of two to three days for them to fully bloom. If you need your White Roses with Pink Tips fully blossomed for your event make sure to order them a few days in advance. 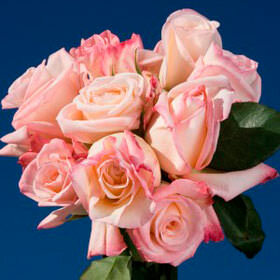 We will ship all of your roses via FedEx, our exclusive courier, in order to get you want you need when you need them. Also, shipping is free to all customers in the mainland USA.